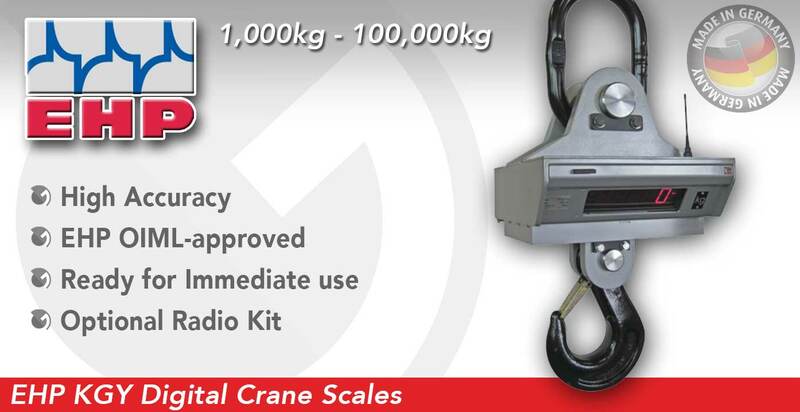 Granada can supply several detachable crane scales / load cells for your business needs. The KGW from EHP is an ultra robust model that is protected against shock loading and predominantly designed for heavy industrial use. Commissioning is extremely simple: Unpack it – hang on hook – start weighing. Wear and tear is virtually non-existent and the design features no mechanical moving parts. Natural wear and tear is virtually non-existent, as there are no mechanical moving parts. The Infra Red hand transmitter enables the scale can be tared off up to a distance of 30 M, without any festooned cables or other wiring. The unit is Extremely simple to use, The subtracted weight when selected is displayed as a negative tare with a “minus sign”. If required, the system may be expanded by using an optional wireless data receiver. Units with weighing Capacities of 500kg to 200,000kg are available. 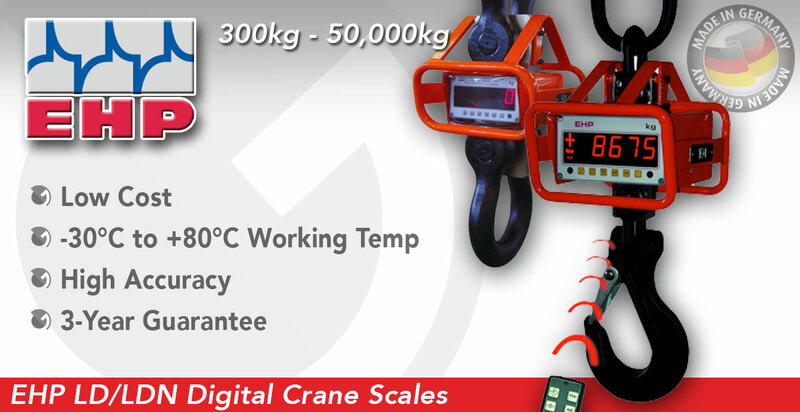 The KGY digital detachable crane scales from EHP is an OIML-approved, electromechanical, digital crane scale. 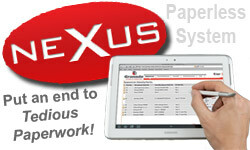 It is extremely robust and accurate, providing reliable economical operations. Accuracy is 0.03% of rated capacity. The unit is ready for immediate use upon delivery, Just hang on hook and start weighing. By using the infrared hand transmitter, you can set the scale to zero and carry out tare operations. As an option, the weighing data can be transferred by radio link to various peripheral equipment/computer. The weighing capacities are between 0 – 100,000 kgs. Units with weighing Capacities of 1,000kg to 100,000kg are available. 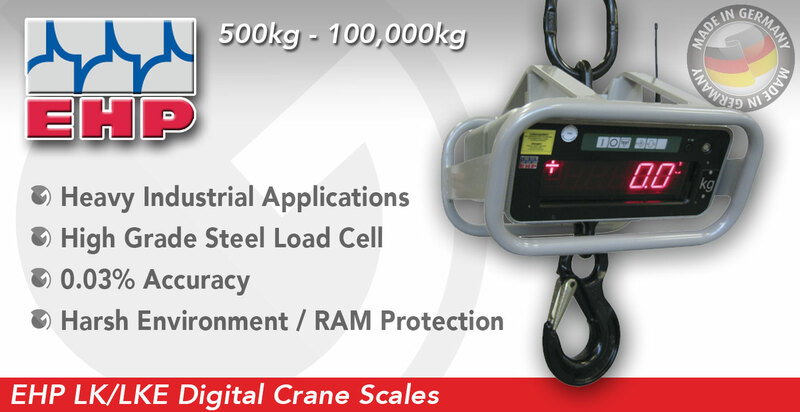 The EHP LD series of digital detachable crane scales ar a low-cost alternative and offer RAM protection. The unit comes complete with a remote control as standard and has an operational temperature range between -30 °C and +80°C. Units with weighing Capacities of 300kg to 50,000kg are available. 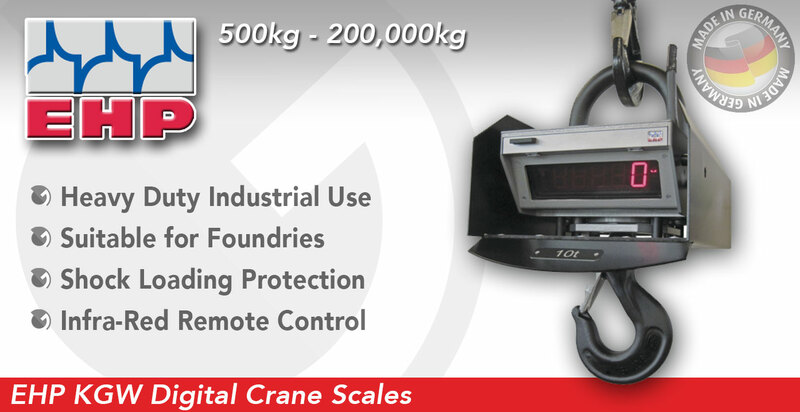 The LK range of digital detachable crane scales from EHP boast a very robust construction for heavy industrial use and the units tension load cell is made of high-grade steel. The front panel hosts a 7-segment LED digital display/update rate of 1 display per second (50 mm high). The LK / LKE is Maintenance-free and features rechargeable 12 Volt accumulators. OIML-approved version LKe: Commercial scale, accuracy class III, EEC OIML R 76 approved to 2,500 divisions. Units with weighing Capacities of 500kg to 100,000kg are available. Optional/retrofit kits: Weighing Data Transmission by UHF radio to peripheral equipments. The Accuway TM Loadcell from AJT is a wired loadcell available in configurations capable of weighing items up to 200,000kg to an accuracy of 1% of the applied load. 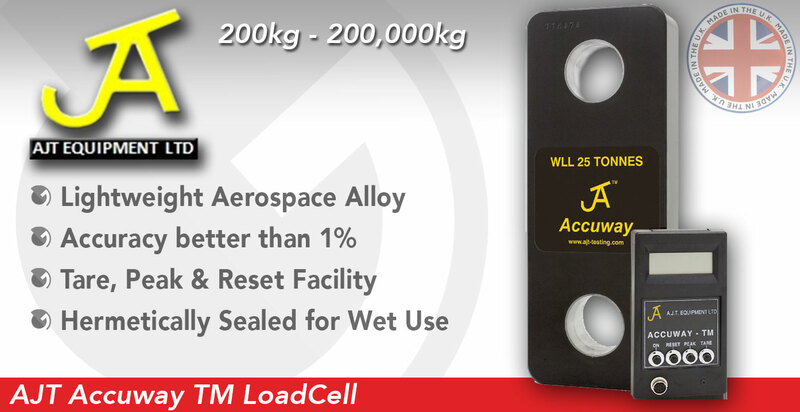 The Accuway TTM Loadcell from AJT is a wireless telemetry loadcell with a range of up to 200m. It is available in configurations capable of weighing items up to 200,000kg to an accuracy of 0.5% of the applied load.